and changed information in a blog. Please be cautious. This is the official site with documentation. I can be reached at 224-603-8317 CST. Check the www.CleanLabelProject.org to see if there are toxins in your dog food. rated as toxin clear. We have switched dog foods to a 5 star brand which is less costly.- 5/18/17. This article was shared with me 03/12/19: Is Cimetidine (Tagamet) a Better Cure for Cancer? See comments from individuals regarding their experiences using this Protocol in Facebook. I created that page at the beginning of 2018. Click above or you can type Tagamet in the Facebook search field. 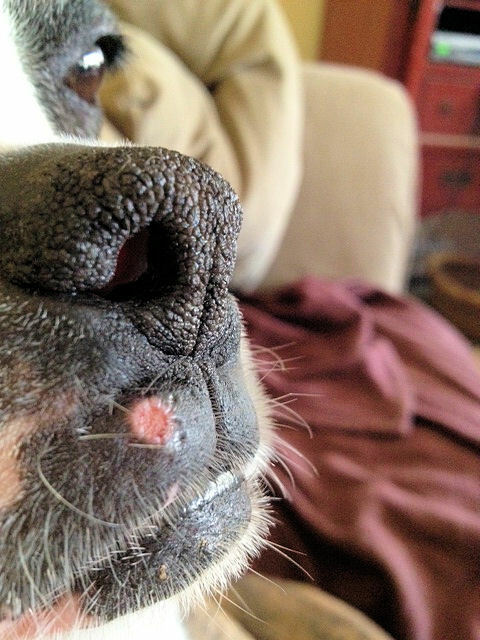 This treatment works on all types of canine cancer! Testimonial – 3/20/17 - There have been hundreds of dogs all over the world who have benefited from this treatment. These are just a recent few. His best buddy from the Toscana dog park is a Golden who had cancer over a year ago. His was operable but, after it was surgically removed, it came back--almost immediately. So his owners, friends of ours, started looking around for a better approach. 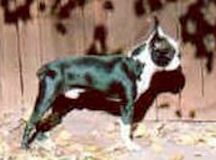 They came across a lady in Wisconsin who is a Boxer breeder. 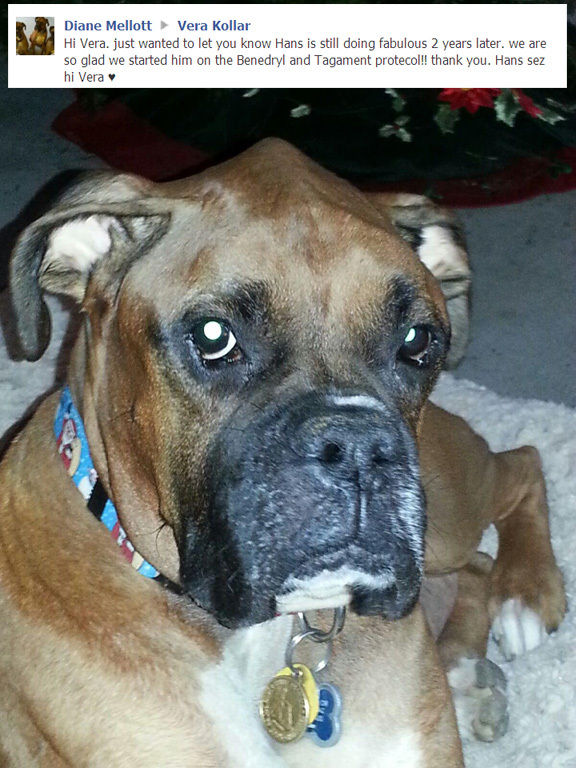 Because Boxers are prone to cancer, she had also been seeking a treatment protocol better than the usual which almost always ended in premature death. She had been pre-med vet school at one time so she had some knowledge of canine physiology and pharmacology. She eventually came up with a drug cocktail based on, of all things, Tagamet and Benadryl. The former’s active ingredient is Cimetidine which was originally developed as a colon cancer drug for humans. The Benadryl inhibits histamine which apparently feeds cell division and mutation. The bottom-line is that she has had amazing results with this simple combo. Whitey’s pal is totally cancer-free now and the developer of the cocktail (you can google Vera’s Boxers if you care) has told us that she recommends it to hundreds of dog owners every year when there is a recurring or terminal cancer situation. Vera told us that almost all of them respond with tumor shrinkage and often survive for several years. Whitey went on this protocol just over three weeks ago. He’s already had some tumor shrinkage based on an ultrasound done a week ago yesterday. He’s getting stronger every day even though, according to his vets, he should most likely be dead by now. We plan to have another ultra-sound at the end of the month and we are hoping and praying to see even more contraction of the tumor mass. One of my good friends and clients is a biotech drug wizard and his wife is a leading oncologist at the Hutch. When he heard about Whitey’s miraculous improvement, he went on-line and learned the science behind why it works. If you are interested, please let me know and I’ll forward it to you. I’m sure many of you know of family and friends who have dogs battling cancer. I can’t recommend this inexpensive and non-toxic therapy highly enough, though, obviously, in our case, it’s still early days and a reversal is certainly possible. Many of you have been praying for Whitey and I can’t thank you enough for that. We even took him to two healing Masses (there’s a sweet irony in fighting a mass with a Mass) . The first was right after he started on the cocktail. He was even anointed, maybe one of the few dogs that’s ever happened to. The next week he even got into Disneyland which I think is also an extreme rarity. Despite the medical plausibility of his treatment, we consider this a divine miracle. The odds against us learning about this were astronomical. Had his best buddy not used it, and had our friends not thought to tell us about it, there really was no hope. 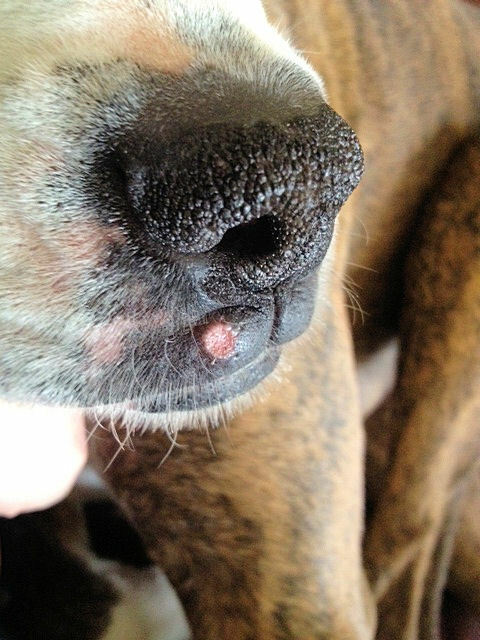 Out of the dozen or so vets we saw or consulted about Whitey’s disease, none mentioned anything about it. In fact, no one else we’ve talked about this with—even serious dog people—have ever heard of it, either. All I can say is, miracles truly do happen. Thank you again for your prayers and concerns! I thought you all would want to see the below. Mike is a good friend and client who has been super-successful in the biotech drug development area. His wife is also a leading oncologist at the Fred Hutchinson clinic in Seattle, one of the finest cancer research and treatment hospitals in the world. So his comments below are quite significant. Whitey has an ultra-sound on Friday, mostly to check out the supposed blood clot in his portal vein but we are hoping to also see tumor shrinkage based on his incredible improvement in energy, appetite, pooping, etc. Wow! I certainly wouldn't have predicted that but stranger things have happened. I did a quick literature review and now I understand the proposed mechanism. Probably would be acting by promoting the infiltration of the tumor by immune cells (tumor infiltrating lymphocytes or TILs). That's a big deal these days as a large number of studies in humans now show a correlation between better clinical outcomes and TILs provided they are of the right type (there are both good and bad TIL's). Immune Checkpoint inhibitor drugs like Opdivo and Keytruda work best in patients with good TIL numbers. Haven't seen data for the combo with Benadryl but that makes sense given the mechanism of Cimetidine. I might speculate that they could potentially block the activity of intratumoral cells called myeloid derived suppressor cells (MDSCs) which is another hot topic. Anyway, bottom line is the approach may work through enhancement of immune function and does have some validation in the bona fide scientific literature. Here is another old girl who had given up due to cancer. She wasn't interested in food or playing anymore. She is in remission now! Click to see her. Titus was on a lot of pain medication as mentioned in the comments! Click on the pictures to move through the photographs. A big thank you goes to his owner Jessica Allen for making his progress available for you to see. Titus will be 9 yrs old on 1.13.13. He couldn't do this before being on the tagemet and benadryl! If you are having trouble viewing the above links, wait a few minutes and try again...it could be due to a high volume of viewers. 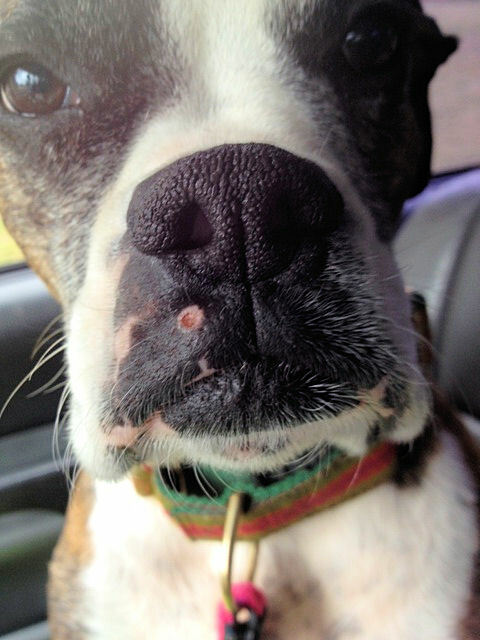 · Mast Cell tumors are comprised of T1 and T2 cancer cells. · Tagamet & Benadryl are over-the-counter drugs that encapsulate the T1 & T2 cancer cells. · Tagamet encapsulates T1 cells and Benadryl encapsulates T2 cells by cutting off the blood and oxygen supply. · This causes the cells to die which shrinks the tumors and puts the cancer into remission. · You may see one tumor, but it is very likely that other tumors may exist in the body that you cannot see. · When a tumor is surgically removed, you are only removing the one you can see. 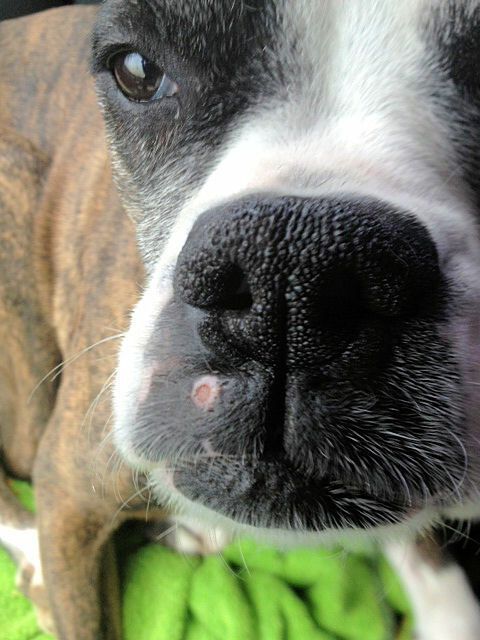 I began using Tagamet and Benadryl to shrink mast cell tumors in 2003 when I effectively shrunk 5 large tumors on a boxer. I have not had to remove any tumors since then. You can call me at 224-603-8317 (home) if you have more questions. I live in Illinois Central Standard Time Zone CST. I use this same treatment to shrink Epuli. If your dog is on any medication, you should always read the PreCautions sheet. Some meds cannot be combined with Tagamet (Cimetidine). updated 6/20/11. twice a day for 3 weeks. 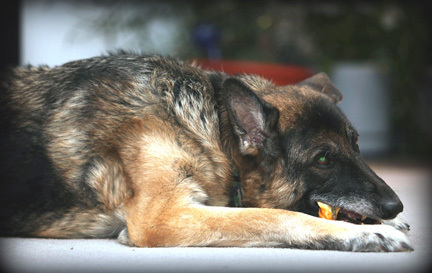 With dogs who are terminal, the treatment is continued for the rest of the dog's life. Some people have increased the Benadryl to 2 tabs per dose with no negative side affects and increased the shrinkage. Each dog is different and you should decide your treatment accordingly. twice a day for 2 weeks. I do this twice a year. It doesn't hurt my dogs and you never know what growths you might be shrinking. I take it too! I have only heard of one dog who was allergic to Tagamet. This sweetheart was feeling miserable 2 days ago and the cancer had swollen both of his front legs...he has now taken 3 full doses of the Tagamet/Benadryl and the swelling is going down on his front legs. His mom said that he looked uncomfortable and I explained to her how cancer dogs/people have trouble maintaining their body heat and suggested she put out an electric blanket or heating pad. She sent this to me an hour later...I think he got comfortable! Titus was on a lot of pain medication as mentioned in the comments! Click on the pictures to move through the 8 photographs. A big thank you goes to his owner Jessica Allen for making his progress available for you to see. I wanted to touch base with you about my Libby. We have been consistently giving her the doses of benadryl and tagamet and she is doing great. I have told several people about you and our neighbor is going to have a friend contact you by email. She just found out her dog has cancer in the spleen. I also gave the vet paper work I printed out from your website. They were surprised to see Libby and how good she looked. You are a God send. Sorry I have not emailed you sooner it's been a crazy week, We started Libby on the medications you told me about plus weaning her down on the prednisone. It took a couple of days but she is back to almost normal. It is so unbelievable. We actually thought we would have to put her down this weekend if she was suffering. The vet Dr. Parker called me yesterday to ask how Libby is and how we were holding up I told her about you and about the benadryl and tagament. She was surprised but wants to see your studies. I already have then as pdf's on my computer because I wanted to bring them in to her to read. I hope she can share this with other patients and their owners. Thank you so much for talking to me. I don't know how long Libby has but at least her quality of life has improved 99%! She even tried to eat of out the garbage today...lol. It's a shepherd thing. My husband is afraid to take her of the prednisone altogether. What do you think about that. Right now I give her a 1/4 of one a day in the weaning process. Hans April 2013 - Tumors are gone! · 6/7/12 - Vera, Hans Update!!!!! today Hans went to the vet for his checkup. no new masses. woot woot!!! also he lost 6 pounds. the vet is amazed. said just keep doing what you are doing. i expect to see him around for a long time!!!!! the vet said she will never question the Benedryl and Tagament treatment again!!! Hans said: I am laughing at you stupid cancer. i am not gonna let you get the best of me!!!! so there!!!! 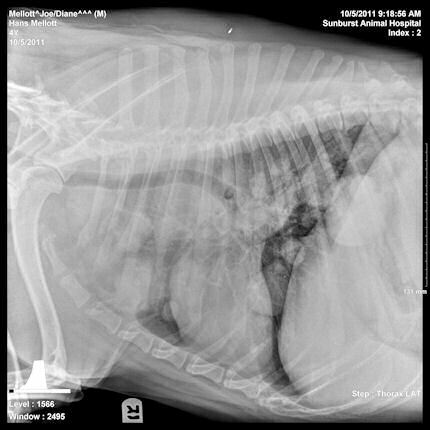 Hans January 2012 - Tumors can be seen in the x-rays. · Nick - We took our 2012 Christmas pics of dogs today. Back in April, I wasn't sure Nick would be in them? Our vet said he had heard of the Benadryl/Tagamet regime and does not believe it works...however, he is amazed at Nicks remission. Nick will be on the B/T regime to the end. He's taking three of each per day, 2 each in AM and one each in PM. I've adjusted the dose depending on how he responds. When he started acting lethargic on 1 each twice daily, I bumped it up and he responded well. He goes in once a month for a check on his calcium levels. Vet wants to keep him on pred to control Ca levels and as long as it's minimal dosages, I'm ok with it. Nick does have a couple big lymph nodes in his neck, large grape size so we're keeping an eye on those too. So happy to hear of Hans story and hope Nick will enjoy a similar remission. But even if he doesn't have the longevity, his quality of life improved with this regiment without toxic side effects and for that we are eternally grateful Vera. Our vet is amazed & thrilled. 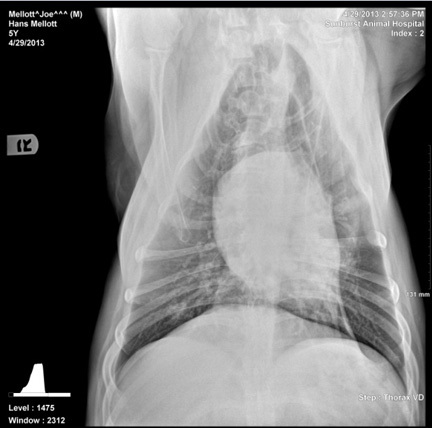 Question: do we aspirate it to re-check? (although there's nothing really "raised" to aspirate) I read (forget where) that aspirating can trigger a histamine release...I know we don't want that to happen. 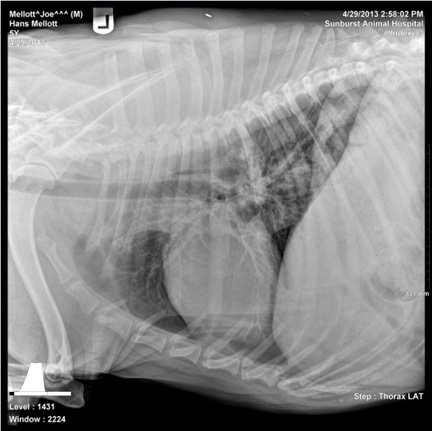 Our vet said his feeling was to leave it alone unless it changed, got bigger, etc. I told him I'd ask you. We are all so thankful for you, for Ellie, for everyone who has come into our lives because of our dogs & for our dogs! Big hugs from all of us & lots of licks from the Boxer kids, especially CLEO! She's showing new foster puppy boy (8-10 mos), Connor, around (who just came out of a shelter where he sat for 7 days after being picked up as a stray. Then yesterday, a week later, relaxing on her perch (dog step aka ottoman) as Connor snuggles with Kirby (senior "forever foster" with cardiomyopathy whom I mentioned to you, Vera) as their human kid gets ready for school. 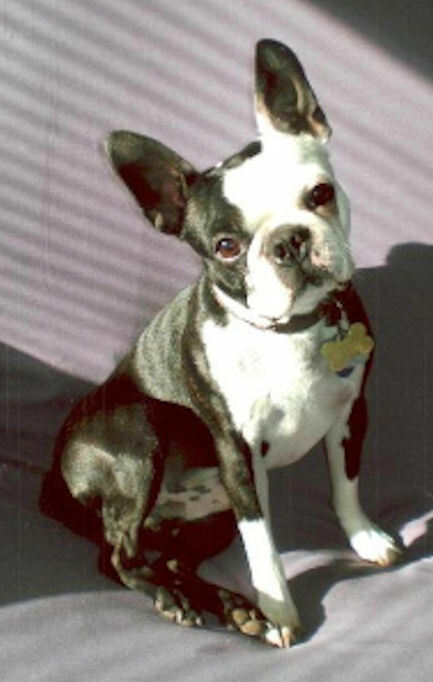 My Boston Terrier, Stetson, had surgery to remove mast cell tumors on August 23rd, and both tumors came back as Grade II, malignant. I was told to keep a close eye on him, and if more tumors appeared to schedule him for more surgery. The following week, another one appeared on his right hock. I contacted Stetson’s breeder, since I absolutely had to vent and worry at someone who knows something about dog diseases and she is a vet tech. She sent me links to your web site and said that people have been trying your way of dealing with mast cell tumors with good results. Then on September 11th I called you to find out more and ask how much to give a 17 lb. Boston, since your site gives the dosages for a 65 lb. Boxer. 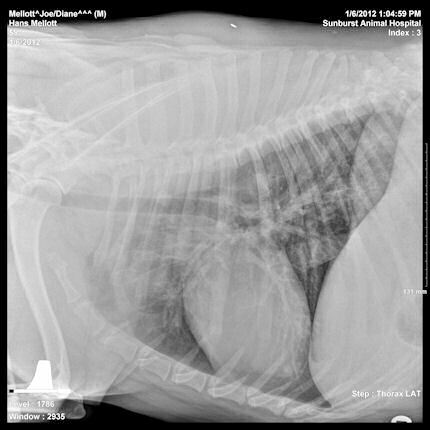 I copied off all the technical information and took it to my vet to ask her about it. Actually, I did this three times wanting her input, but couldn’t get her to do more than glance at the papers and set them aside. On the third try, she told me I could try it, but to increase the dosage of the Benedryl to a whole tablet twice a day and to forget the Tagamet, because that’s only for upset stomachs. She still would not read the information. 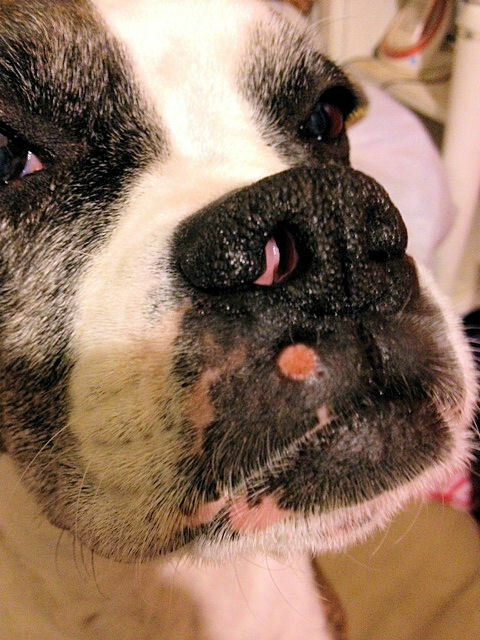 He got a whole Benedryl tablet twice a day, and the tumor on his hock slowly got bigger. I was torn between taking him in to have it removed or trying the treatment. Because of its location, I didn’t see how the vet would be able to take it off with clean margins and still leave enough skin to close the wound without its tearing open when he walks. I prayed about it, and my gut feeling was to try the treatment with the Tagamet. He’s been on a whole Benedryl and 1/3 of a Tagamet twice a day for 6-7 weeks now, and the tumor on his hock is almost gone. He has more energy, and I’ll cut the Benedryl down to half a tablet twice a day like you recommended. Feel free to share what I have written here. Stetson will celebrate his sixth birthday this Saturday. I’m not too good with a camera, but here are a few pictures of my beautiful boy. And thanks again! 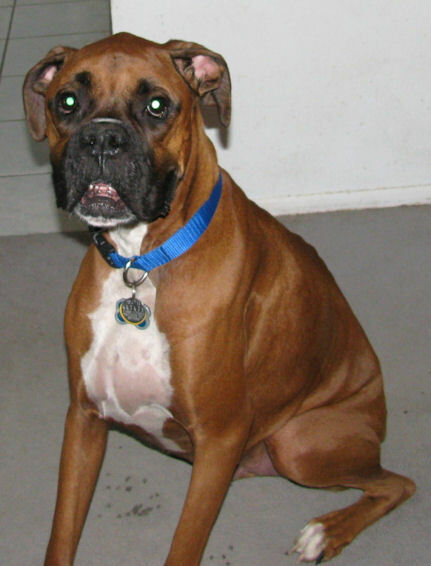 · I will happily give testimony to this particular treatment :) My boxer was diagnosed with lymphoma (Gastrointestinal type) last August. I had prayed at the time that she would be able to stay with me and I am happy to report that we will celebrate her 10th birthday this month. I am not a big fan of chemo or radiation treatments and surgery was not an option. I believe in the quality of life and will never take drastic steps to just put off what will eventually take them regardless of chemo or surgery and so I have done no other treatment other than the Tagament and Benedryl twice a day. There are times she is bloated and I have used Lasic to help with the fluid build up but that is the only additional treatment she has received. Her gums remain a light pink and I realize that the cancer is slowly taking over. Right now I am having to encourage her to eat by offering puppy food (canned) and Bil-Jac (frozen variety - thawed of course). She insists that I stay by her crate and watch her eat but that's a small price to pay for her continued company. · It was a fight to keep my own cancer afflicted girl. You know her by her name Miranda Sue, She was a delight and the light of my life. In her last year, I went with Vera's Therapy. She had a nearly year of happy life left before she went to the bridge. · I think you are keeping some stats on this...so just to let you know, Duke passed away on dec. 1. He had another large tumor on his heart. I do think the tagamet and benedryl helped him tremendously. · June 20, 2011 - She is doing great! We keep checking the area, but so far the tumor has not come back. Thanks for remembering and all your help. Dec. 30, 2010 - Misty is doing fine. Back to her normal, energetic self. 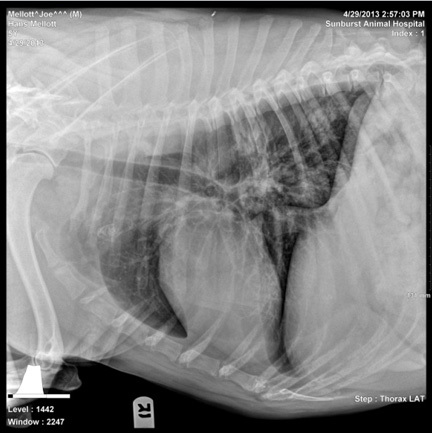 We have to keep checking the area where she had the nerve sheath tumor. They expect it to come back in 6-9 months. If it does they will operate again and take out a larger area since they know the type of cancer. I’m giving her the preventive dose of Benadryl/Tagamet to see if that helps. Dec. 6, 2010 - Have you heard if Tagamet/Benadryl works with nerve sheath tumors? I have a lab/boxer mix that just had one removed and the vet said there’s a good chance it will reoccur in the same spot within 6-9 months. · Treasure is feeling great! She is still on Tag/ben. plus antibiotics and KD. Happy girl! Making our debut in obedience tomorrow morning! · Thanks! I know lots of people have had success with this, I have even researched its origin in human colon cancer studies. I work in pathology. · I have found no ill effects of this treatment and encourage any of you who have dogs diagnosed with this dreaded disease to consider it. 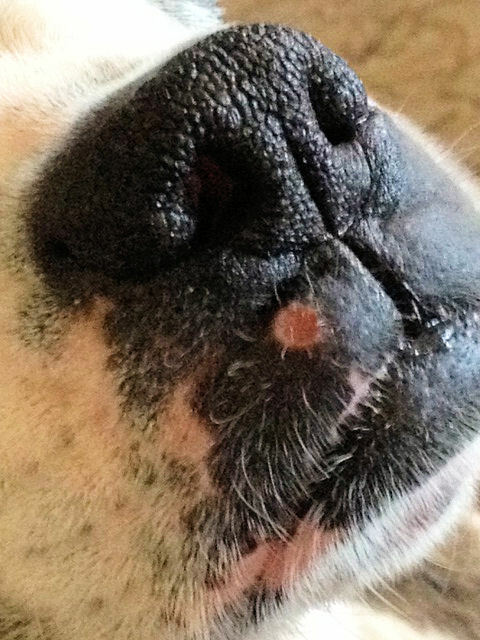 · I recommended it for a friend's boxer who was diagnosed at least three years ago with cancer of the tonsil. She's still here and doing just fine. The vet can't quite believe it!!! Some relative of hers also tried it on their lab with good results. 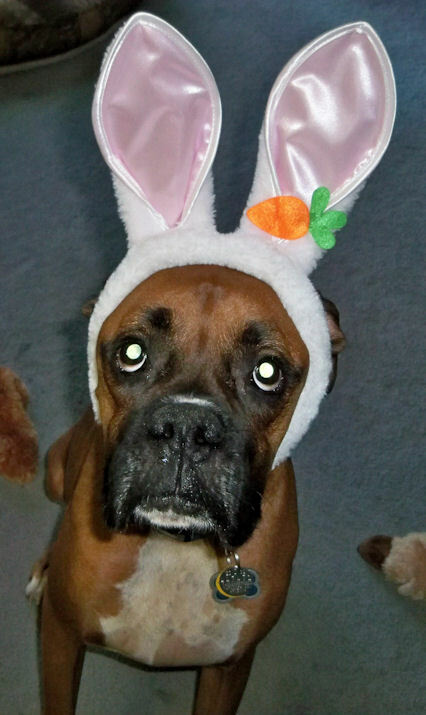 · I tried it on 2 of mine and it works to extend the lives and comfort of the dogs even with lymphoma. 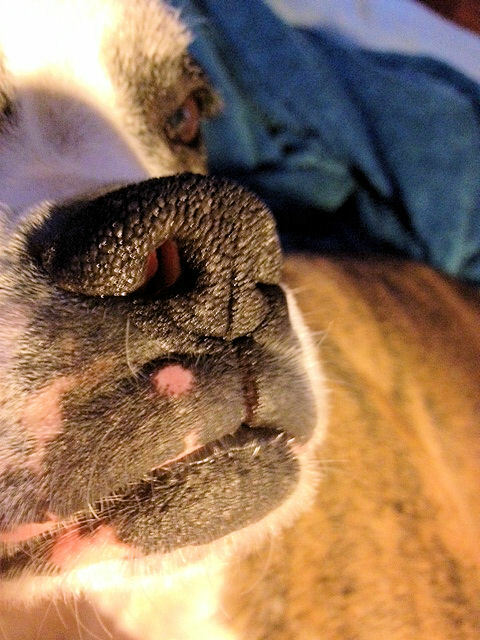 · Your Benadryl/Tagamet treatment saved my friends Boxer here in Canada!!! The Vets are stumped and don't believe that your treatment was what helped. They say "well sometimes we're lucky and these things will go away on their own". Well, we know the truth and are so thankful to you! 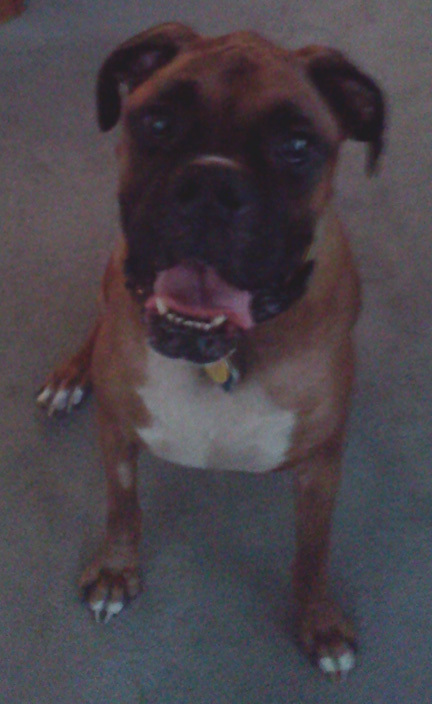 My boxer is now 10 and still doing awesome! leg. She could cup her hand around it as it was large. Her vet wanted to remove it and graft skin (he was doubtful that it would work) and possibly remove the dog's leg. She had heard me talk about the Tagamet/Benadryl treatment and called me to ask me what dose I was using to shrink tumors on my dogs. 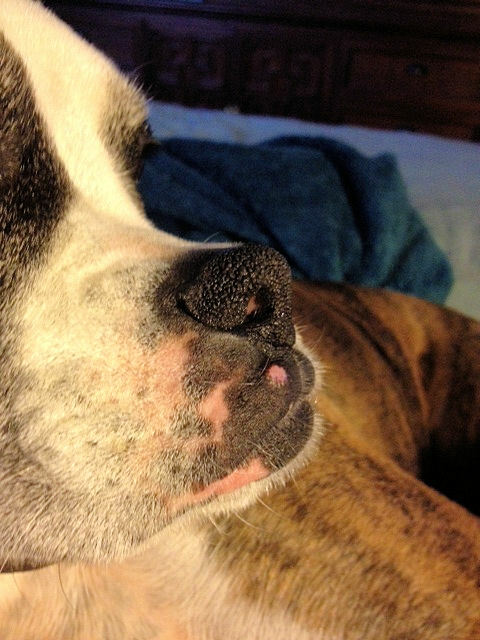 For boxers, I use 1 Tagamet 200 mg and 1 Benadryl 25 mg every morning and night for 3 weeks. She doubled it for her large mastiff. Well, she called me after 10 days to tell me the tumor had shrunk and seemed to be gone. Her vet couldn't believe it. My feeling is that the worst outcome would be that it doesn't work. But I believe it is definitely worth the try. I haven't had cancer in my dogs since with the exception of a 10.5-year-old who developed lymphoma. I kept her very happy and comfortable for 8 mos. past the diagnosis with the Tagamet and Benadryl when cancer is evident. 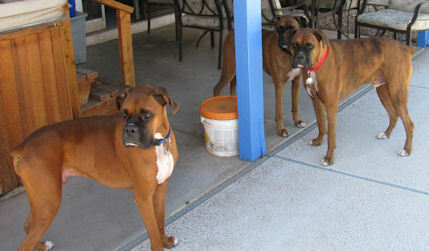 I have 6 boxers living with me and they have been cancer-free. Since that time, I put my dogs on a Tagamet/Benadryl Preventative Therapy Treatment twice a year. It doesn't hurt my dogs and you never know what growths you might be shrinking. My husband and I do it to! I hope it can help some of your dogs!